Set in a lush green garden with sparkling pool and braai facilities, NATANJA Guest House offers superb accommodation for the tourist or business person based in Centurion. At Natanja Guest House you will enjoy hospitality and tranquility. 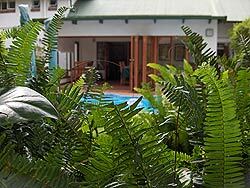 Next to the guest house is our self catering accommodation which can sleep 8, with one or two bedroom, self catering units with fully equipped kitchens, lounges, colour TV's with M-Net, patio, private garden, lock-up garage and secure parking. Units are cleaned on a daily basis. Full use of braai facilities and swimming pool. These units are preferred for periods 7 days or longer. * Special rates for long term bookings. * Additional fees for every extra person. * Fees negotiable depending on length of stay. Ideal for long term accommodation. There are emergency toiletries available at reception, and supply broadband wireless internet, as well as satellite TV. Natanja's guest house and self catering has a verandah, and braai area with swimming pool and is wheel-chair friendly. We provide secure parking, and a laundry service. As a guest house we serve bed and breakfast and do dinner on request. There are newspapers daily and postal services available at reception.